^ Coling, Adrienne. (Video) Evergreen Extension is opening December 2, 2016. The Buzzer blog. TransLink. 2016-11-07 [2016-12-14]. 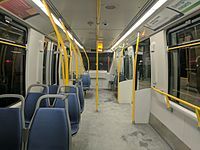 ^ Hales, Roy L. Metro Vancouver to have Canada's Longest Transit System. The ECOReport. 2014-03-07 [2016-12-14]. ^ Heckenast, Joe; McGraw, Jim. Your Ride Guide 2006 (Vancouver Sun, with TransLink and Bombardier). 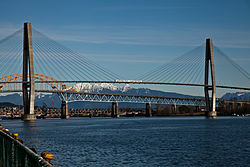 New Westminster, B.C. : McGraw Media: 14. 2006. 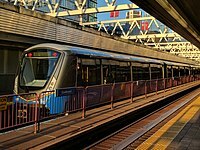 ^ Skytrain: The Smart Choice for Greater Vancouver. American Public Transportation Association. [2007-01-14]. （原始内容存档于2007-09-27）. ^ Overview and Route Map. InTransitBC. [2006-12-17]. （原始内容存档于2006-12-16）. ^ Greater Vancouver Transportation Authority Transit Tariff (PDF). TransLink. January 1, 2005 [June 17, 2007]. （原始内容 (PDF)存档于2005年5月13日）. ^ Canada Line YVR AddFare. TransLink. [2016-11-07]. ^ Translink. Canada Line Controlled Access, Safety & Security and Fare Evasion (PDF): 8. 2005-12-01 [2007-06-18]. ^ Riding without paying will cost $173. The Province (CanWest MediaWorks Publications Inc). 2005年3月20日 [2006-12-14]. ^ Construction starts on SkyTrain faregates in Metro Vancouver. 溫哥華太陽報. 2011-07-20. （原始内容存档于2011-07-26）. ^ Judd, Amy. Full fare gate closure at SkyTrain stations to begin today. Global News. 2016-04-04 [2016-10-24]. ^ TransLink's fare cards to be called 'Compass'. 溫哥華太陽報. 2011-03-31. （原始内容存档于2011-05-06）. ^ Compass Tickets—Coming Soon to a SkyTrain Station Near You!. 運輸聯線. 2015-08-26 [2016-10-24]. ^ Canada Line Rapid Transit Inc. Working: Annual Report 2006 (PDF): 33. [2007-06-17]. （原始内容 (PDF)存档于2007-06-21）. ^ Translink. TransLink Annual Report 2003 (PDF): 22. [2007-06-17]. （原始内容 (PDF)存档于2004-08-29）. ^ Ministry of Finance and Corporate Relations. Debt Statistics 1998/99 (PDF). British Columbia: 5. 1999-08-31 [2007-06-17]. （原始内容 (PDF)存档于2007-06-21）. ^ Greater Vancouver Regional District. The Livable Region 1976/1986: 21–24. 1975-03-26. ^ Keating, Michael. $61 million experiment could go down the drain New money crucial to give sky subway a shot at markets. 環球郵報. 1971-11-13: P5. ^ 25.0 25.1 It's SkyTrain (PDF). The Province. December 11, 1985: A10. ^ J. C. Dunn, Christoper. The Institutionalized Cabinet: Governing the Western Provinces. Montreal and Kingston: McGill-Queen's University Press. 2003. ISBN 0773512837. ^ The SkyTrain Tunnel. Vancouver History. [2007-06-12]. ^ Mason, Bruce. SkyTrain and Cambie Bridge taking us down road to Expo Series: The Eighties; [1* Edition]. The Province. December 31, 1989: 20. ^ Vancouver History 1985. VancouverHistory.ca. [2008-10-29]. ^ 30.0 30.1 Vancouver Regional Rapid Transit Project Quarterly: Winter 1986 (PDF). BC Transit. [2011-10-23]. ^ The British Columbian Building (PDF). City of New Westminster: Active Living Guide. [2012-12-23]. ^ More SkyTrain history with Alan M: photos of Scott Road Station, 1990. TransLink. 2011-01-31 [2012-12-23]. ^ Expo Line Upgrade Strategy: Project Summary (PDF). SNC-Lavalin. [2012-12-22]. （原始内容 (PDF)存档于2013-06-05）. ^ BC Transit General Information. [2007-04-10]. ^ Office of the Comptroller General. British Columbia Rapid Transit Company Ltd. Financial Statements for the Fiscal Year Ended March 31, 1999. BC Ministry of Finance and Corporate Relations. 1999-05-07 [2007-06-16]. ^ Annual Report: Fiscal 2001/2002 (PDF). Rapid Transit Project 2000 Ltd. [2012-12-26]. ^ New VCC-Clark Millennium Line Station opens January 6. TransLink. 2005-12-23 [2012-12-28]. （原始内容存档于2011-11-19）. ^ Opening Day: August 17th, 2009. Canada Line. [2009-08-04]. （原始内容存档于2009-08-08）. ^ Evergreen Light Rail Transit Project: Project Definition Phase Business Case (PDF). TransLink. 2006-10-13 [2012-04-13]. （原始内容 (PDF)存档于2010-11-05）. ^ 45.0 45.1 TransLink's light-rail transit line gets a name. TransLink. 2005-12-07 [2012-04-13]. ^ 47.0 47.1 ALRT Technology Recommended for Evergreen Line (PDF). British Columbia Ministry of Transportation; TransLink. 2008-02-01 [2012-04-19]. ^ Brown, Scott. TransLink will open Evergreen Line on Dec. 2. Vancouver Sun. 2016-11-07 [2016-11-07]. ^ Tri-Cities rejoice: The long-awaited Evergreen Line opens. CTV Vancouver. 2016-12-02 [2016-12-02]. 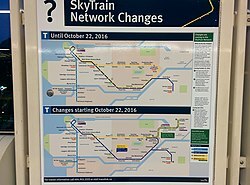 ^ Everything Evergreen: New SkyTrain operating pattern for Expo and Millennium Lines. 運輸聯線. 2016-09-19 [2016-10-24]. ^ Safety and Security on SkyTrain. The British Columbia Rapid Transit Company Ltd. [2010年2月27日]. 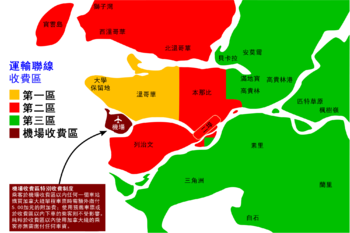 （原始内容存档于2010年2月23日）. ^ Vancouver SkyTrain Network, Canada. railway-technology.com. [2010年2月27日]. ^ Specifications: Vancouver SkyTrain Network, Canada. railway-technology.com. [2010年2月27日]. ^ Livable Regional Strategic Plan 2002 Report (PDF). 大溫哥華區域局. [June 10, 2007]. （原始内容 (PDF)存档于2007-06-21）. ^ Bombardier lands $113M deal with Vancouver SkyTrain. CBC News. 2006年11月23日 [2010年2月27日]. ^ TransLink to spend $150M on buses, SkyTrain by 2010. CBC News. April 11, 2008 [December 5, 2008]. ^ Infrastructure, Transportation and. Contract signed with Bombardier to supply Evergreen Line SkyTrain cars. archive.news.gov.bc.ca. [March 26, 2016]. ^ Bombardier. Bombardier Innovia ART. [September 30, 2016]. 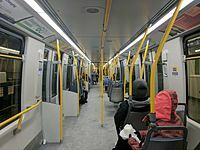 ^ First Vancouver SkyTrain Mark III vehicle enters service. Railway Gazette. August 19, 2016 [August 22, 2016]. ^ Jeff Nagel. TransLink 'not disappointed' after new SkyTrain stalls. Maple Ridge & Pitt Meadow Times. September 26, 2016 [September 30, 2016]. （原始内容存档于2016年9月27日）. ^ The Canada Line Factsheet – The Canada Line Vehicle (PDF). 大溫哥華區域局. [December 5, 2008]. ^ Canada Line Construction Environmental Management Plan (PDF). ProTransBC. [2010年2月27日]. ^ TransLink's UBC Line Rapid Transit Study Shortlist of Alternatives (PDF). 溫哥華市政府: 2. [2012-05-02]. ^ 67.0 67.1 Millennium Line Broadway Extension Project. 運輸聯線. [2016-12-07]. ^ 68.0 68.1 Chan, Kenneth. TransLink must find remaining $765 million for Broadway Subway and Surrey LRT: federal budget. VanCityBuzz. 2016-03-23 [2016-12-07]. ^ 69.0 69.1 69.2 Chan, Kenneth. It's official: Broadway Subway and Surrey LRT will be built in $7-billion transit plan. Daily Hive Vancouver. 2018-03-16 [2018-03-30]. ^ Mayors' Council announces historic $7 billion transportation deal. CBC News. 2018-03-16 [2018-03-30]. ^ 71.0 71.1 Nagel, Jeff (January 16, 2008) "More SkyTrains for Surrey". Surrey North Delta Leader. Retrieved on: January 25, 2008. ^ Provincal Transit Plan Brochure (PDF): 8. [2012-05-02]. （原始内容 (PDF)存档于2008-04-11）. ^ September Service Changes – New 96 B-Line!.August 26, 2013,Translink. ^ Surrey Light Rail Transit Project. Translink. Evergreen Light Rail Transit Project: Project Definition Phase Business Case (PDF). TransLink. 2006-10-13 [2012-04-13]. （原始内容 (PDF)存档于2010-11-05）.